Since I've never really been satisfied with my Ciabatta, I tried to do it in a more conservative way. 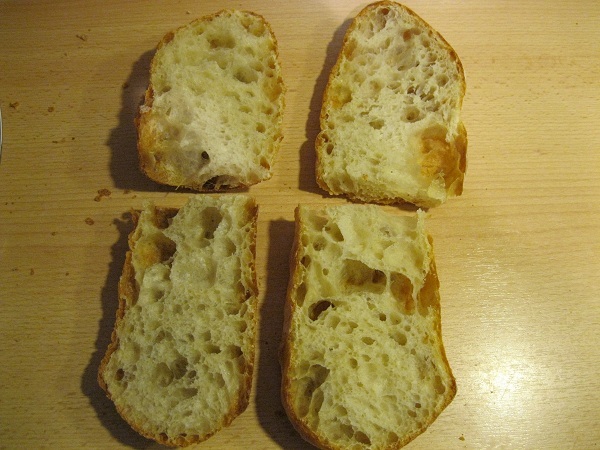 I only used a 75% hydration dough, so the lower end of the Ciabatta range. Instead of doing the stretch & fold directly in the bowl with wet hands, I did it on the floured work surface, which took a little more time. I carefully followed the principle of the dough having an axis with two poles (the smooth side and the sticky side). The result was a dough that was so strong that I couldn't even really stretch it in order to cut out the pieces. In the oven the loaves expanded so much that part of the crust opened. I didn't watch the baking process well enough in the end phase, so the crust burnt a little and the bread dried out a little around the outer layers of the crumb. The crumb wasn't extremely open. Still I am really happy about how they came out and how strong the dough was. One of my favorite breads for sandwiches, great looking crumb! 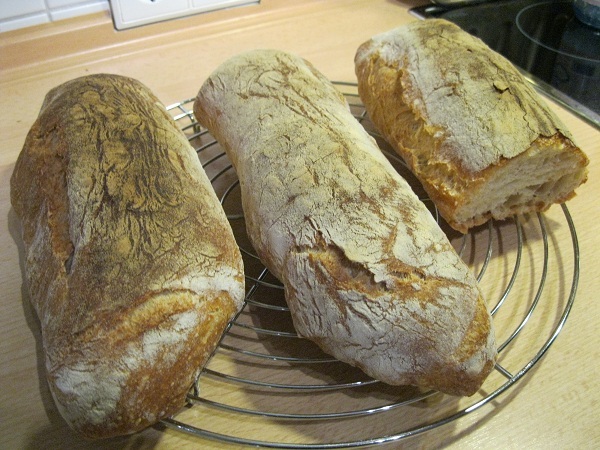 I haven't tried Ciabatta yet... I have seen your ciabattas that motivates me to give a try.... They look so good! I like rustic looking bread. would seem to justify your thinking about a too-closed crumb, the longitudinal split says otherwise. However, if you just can't leave well enough alone, maybe one less S&F? Or a longer rest between last S&F and shaping? Sorry, all three of them were gone withing about 24 hours :), maybe next time. Well, of course overall I was satisfied with the result. I was just loudly thinking about what adjustments would have been possible. But actually you're right about doing one less stretch & fold. After the third and last one it was very difficult to handle it without ripping the surface as there was so much tension.